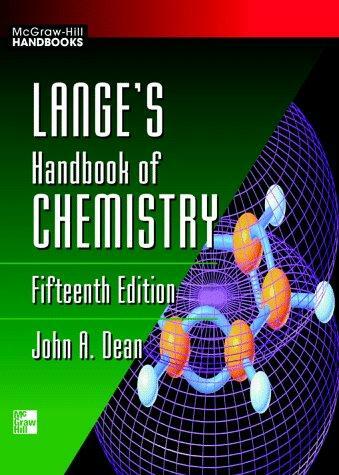 Lange's Handbook of Chemistry by John A. Dean ~ Engineering projects ideas for final year students & paper presentations collection blog. Engineering projects ideas for final year students & paper presentations collection blog. All the latest ECE projects, EEE, Mechanical projects, CSE, IT projects, computer projects are updated here for indian students. More than 3000 engineers find our updates useful. You can get them at your mail box! 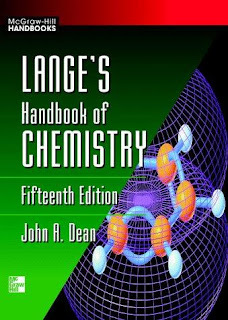 Revered as the standard reference for chemists for more than 60 years, this new edition of Lange's brings chemistry professionals, students, and anyone interested in science an enormous compilation of facts, data, tabular material, and experimental findings in every area of chemistry. Included in this massive compendium are listings of the properties of approximately 4,000 organic and 1,400 inorganic compounds. The 15th Edition includes new material on separation methods and analytical chemistry; statistical methods; polymers; rubbers, fats, oils, and waxes; new inorganic compounds; IUPAC nomenclature of organic compounds; updated lists of physical and chemical symbols; definitions and abbreviations; new tables, charts, and illustrations; with SI units used throughout (conversion tables supplied). The American Technical Technologists' Events magaine said of the last edition of this book, "Bargains are rare in the publication arena but this book represents one ... it is just overflowing with useful information that is available at your beck and call." This blogs is an effort to club the scattered information about engineering available in the web. While every effort is made to ensure the accuracy of the information on this site, no liability is accepted for any consequences of using it. Most of the material and information are taken from other blogs and site with the help of search engines. If any posts here are hitting the copyrights of any publishers, kindly mail the details to yuva.2712@gmail.com. it will to removed immediately.